Nearly two long years ago, when the U.K. began its negotiations with the E.U. over the terms of Brexit, Prime Minister Theresa May asserted that she would fight for the best deal possible for Britain, but that no deal was better than a bad deal — she wouldn’t hesitate to walk away if Europe didn’t give her a divorce Britons could live with. To May’s right, hard-line Brexit supporters were confident that E.U. negotiators in Brussels would give the U.K. whatever it wanted, because they needed Britain more than Britain needed them. To her left, Labour Party leader Jeremy Corbyn was courting Leave voters with visions of a better Brexit deal for the common man than May’s Conservative government was likely to make. Now, with the Brexit due date less than three months away, things have changed. May, who didn’t support Brexit in the first place, is desperately trying to get a relatively bad deal through Parliament, warning of the perils of no deal but describing the worst-case scenario as no Brexit at all. Corbyn is still stumping for his better deal — even though most of his party would rather have a second referendum — but is primarily fixated on his quixotic ambition to unseat May and form a Labour government. The hard Brexiteers, meanwhile, are past claiming they could make a better deal than May and have moved on to claiming that no deal is no big deal. May’s proposed agreement, which she and European leaders have underscored ad nauseam is the best deal possible, comes before Parliament for a vote today, where it is almost guaranteed to fail. U.K. legislators were set to vote on it last month, but May canceled the vote rather than see her plan go down by a triple-digit margin. After surviving a confidence vote within the Conservative party, which inoculates her against being ousted for a year, the prime minister is now willing to go through the motions of losing this vote as the next move in her ongoing game of chicken with Parliament. In an impassioned speech set against the backdrop of a china factory in the Leave-voting industrial city of Stoke-on-Trent, May pleaded with MPs to give her deal a second look. “No it is not perfect,” she said. “And yes it is a compromise,” but, “I say we should deliver for the British people and get on with building a brighter future for our country.” In a private meeting with Tory lawmakers, she also stressed that passing her deal was the best way to prevent Corbyn from becoming prime minister. To sweeten the pot, May’s government has indicated that it would accept an amendment to her proposal that would let Parliament vote on whether to extend the 21-month post-Brexit transition period and on whether to implement the backstop provision designed to prevent a hard border in Ireland in the event that the U.K. and E.U. fail to reach a final trade agreement before that period ends. That’s just one of many amendments that have been proposed, some feasible and some not. Andrew Murrison, the chair of the Northern Ireland affairs committee, has tabled one that would impose a definite end date to the backstop arrangement, in hopes of wooing Tories and Democratic Unionist Party MPs who see it as a trap that would leave the U.K. stuck in the E.U. customs union indefinitely. That amendment is unlikely to pass today, but could form the basis for an eventual compromise as zero hour bears down on lawmakers. The other problem with Murrison’s amendment is that the E.U. has preemptively shot it down. Downing Street published an exchange of letters on Monday between May and the E.U.’s two most senior officials, European Commission president Jean-Claude Juncker and European Council president Donald Tusk, in which the Europeans refused to put a 12-month time limit on the backstop but offered other assurances that they were serious about avoiding that worst-case scenario and that it would only be temporary if it did come to pass. If (honestly, when) May’s deal fails in Parliament, her next move will likely depend on the margin of her defeat; in any case, she has no good options. She can go back to the E.U. for more assurances and keep trying to whip votes before March 29, which is unlikely to make much difference as there simply is no deal that would satisfy both the E.U. and the nativist Tory rump. She can revoke the U.K.’s notice of intent to leave the E.U. and thereby delay the Brexit date, which she has said she won’t do. Or she can resign as party leader and let a hard-Brexit Tory like Boris Johnson find out the hard way that no, he can’t get a better deal than she did. Her rivals, meanwhile, will make moves of their own. Corbyn has said Labour will call a vote of no confidence in the government after helping vote down May’s plan, “at the moment we judge it to have the best chance of success.” His party can’t win that vote on its own, though, nor is it at all certain that Corbyn could assemble a majority in Parliament if he did manage to topple May’s cabinet. In that case, a snap election would be forced. If Labour somehow manages to form a government, its grand strategy going forward is to delay Brexit so it can negotiate some more. Parliament could also take matters into its own hands and wrest the Brexit agenda from the government’s hands, possibly forcing through an alternative plan along the lines of Norway’s relationship with the E.U. This, however, would be a constitutional struggle, representing what political scientist Philip Cowley described as “one of the most fundamental shifts in (the) relationship between the government and parliament since … 1642.” The battle over Brexit has already tested that relationship considerably. 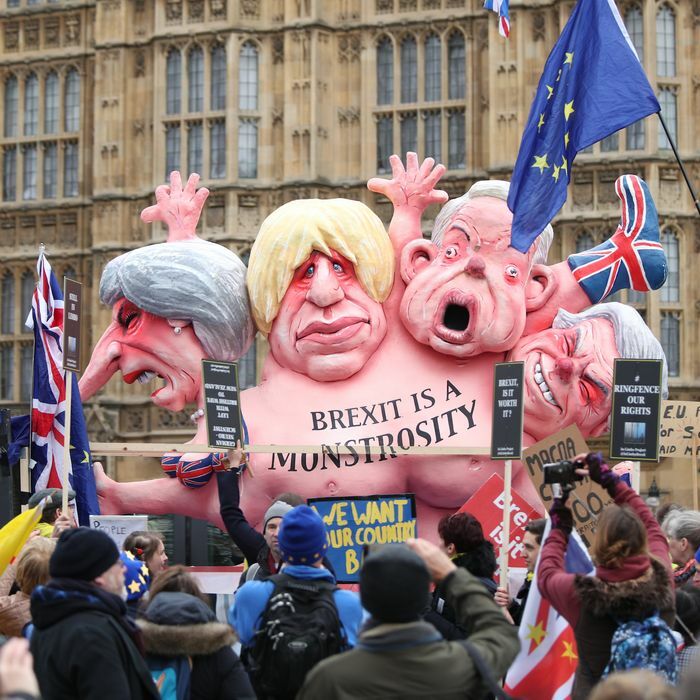 It’s also straining the conventions that govern parliamentary procedure in Westminster, such as the partisan neutrality of the Speaker of the House of Commons, who has been accused of tipping the scales against Brexit. The upshot of all this turmoil is that the U.K. is looking more and more likely to face a no-deal Brexit at the end of March, whether or not anyone wants it. Even while repeatedly insisting that this was an extremely unlikely scenario, the government spent the past several months preparing for the U.K. to crash out of the E.U., attempting to clarify its impact on immigration and other policy areas, and stockpiling food and medicine in anticipation of import controls with Europe and chaos at the ports in April. On Sunday, it came out that the Ministry of Defense had dispatched military planners to several other government departments to help with contingency planning. Private businesses in the U.K. are also increasingly operating under the assumption that there will be no deal, while households are starting Brexit stockpiles of their own. Private-citizen Brexiteers are also increasingly eager to get out of the E.U. with or without a deal. In a recent poll, 76 percent of Conservative party members said they preferred no deal to May’s deal, illustrating the stark division between the Tory base and its leadership. Reporting on Sunday from Boston, England, where 75.6 percent of residents voted Leave, the Washington Post found ardent Brexit supporters receptive to Davis’s assurances that the no-deal horror scenarios were baseless scaremongering. “I think we should give it a try; we can always go back in,” Watson said. When asked about the predictions of economic ruin, she wasn’t convinced. “We don’t know until we try,” she said.